These metal diaphragm single-stage regulators are specially designed for laboratory applications requiring both high reliability and diffusion resistance. They are recommended for high purity non-corrosive gases where inlet pressure does not vary greatly (such as liquefied gases), or where periodic readjustment of delivery pressure setting does not present a problem. Stainless Steel Diaphragm minimizes diffusion of air into regulator and eliminates “off gassing” associated with elastomeric diaphragms, thus maintaining gas purity. High Purity Regulator Design permits vacuum purging of regulator. Diaphragm Seal Outlet Valve maintains gas purity. Chrome-Plated Surfaces provide polished appearance and ease of cleaning. Cartridge (Encapsulated) Seat Assembly provides for ease of maintenance and repair. Filter in Seat Assembly traps foreign matter, extends regulator life and reduces maintenance. 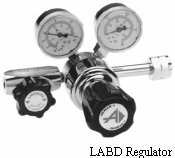 Relief Valve protects regulator components from the effects of overpressurization. Where “(CGA)” is indicated above, insert appropriate Compressed Gas Association connection number to complete the part number. Example: LABD-3-15-580. Order by complete part number.